For the discerning caravanner who demands the finest lightweight awnings we have combined the superlative features of classic and lightweight awnings to produce a hybrid that gives you the best of both worlds. The awning is produced in extra-high quality WeathershieldTM Pro material that looks and feels like a traditional material but has all the benefits of modern technology. We’ve made improvements to the latest models to ensure that the Rally Pro remains the best lightweight awning available. 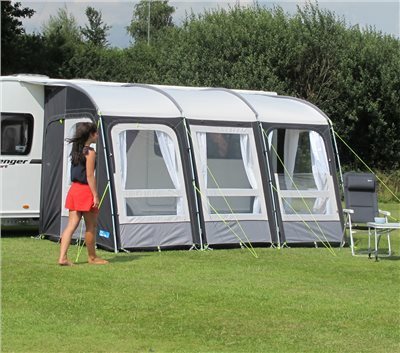 Refreshed for 2019, the Rally Pro now features an aluminium frame, drastically reducing the weight of the awning and preventing corrosion. The front legs remain adjustable to ensure a perfect pitch every time. The Rally Pro is available in a striking Grey/Charcoal colour combination; this look is complemented by the curtains, for both the front and side windows, that slide on an easy-run track. There’s a Rally Pro awning to suit all caravans and purposes, whether it’s the 200 for a quick weekend away or the 390 for an extended holiday. Whichever size you choose you can be sure that it’s quick and easy to set-up. Zip-out side panels offer even more flexibility. The side panels are interchangeable, allowing you to change the door positions on your awning and an optional annexe can be zipped into either or both sides. The annexe is also simple to set-up and comes complete with an inner tent. It creates excellent additional accommodation or can be used for extra storage. Further customisation is available with our range of optional equipment including our organisers and hanging rails that can be attached to our AccessoryTrackTM, pre-fitted to all Rally Pro awnings. Is this an all season awning.? Cheers.